Knockout products, overseas direct purchasing, the emergence of micro businesses, tax cuts on spirits, consumption upgrade and snatching market shares in the second and third tier cities - behind the hot words, the overall landscape of the Chinese wine market is still undergoing radical changes. In the new year, higher differentiation requirements are put forward for the upgrade of the market. Nevertheless, the segmentation of features and the innovation of both brands and forms of business have become inevitable trends. In this issue of Topic of the month, ProWine China has specially invited Mr. Dai Hongjing (Ian Dai) to talk about new opportunities in the wine market in 2018. The year 2017 witnessed market recovery. Across the country, numerous wine brands as influential as beers and liquors started to emerge. Small importers were flourishing. More chateaus wineries and multinational wine groups established offices in China. Meanwhile, we received positive feedback from a lot of vintners. Where are opportunities and challenges? The following are the views of selected vintners. Headquartered in Beijing, JoyPattern (Beijing) Trading Co., Ltd. was founded in September 2013. Since its inception, the company has been operating on a small scale with a total staff of 10 or less. In addition to Beijing, JoyPattern has also opened an office in Frankfurt. The company’s position is an importer specializing in German wines, mainly Riesling. As an importer which only imports German wines, how do you view your advantages and disadvantages? “Germany’s Riesling enjoy obvious features and advantages. However, due to the small amount of output and the vast majority of them being consumed by Germans, there is little access to the domestic market. It is really hard to organize a vertical tasting. In addition, the trading with some established wineries has been monopolized by veteran importers, making it difficult for other peers to import directly from the chateaus.” In response to the difficulty, he said: We take advantage of the resources of the German office to reach small boutique wineries that have high prestige in Germany but are not yet known to domestic consumers. For example, August Eser in Rheingau we tapped last year has repeatedly won awards. Its wines were sold out quickly, boosting the company’s popularity and promoting sales of other wines. With regard to challenges in 2018, he said we are considering how to maintain and improve our market position in the competition given the growing number of German wine importers. We think the ultimate solution is to improve professionalism. Since we are specialized in a single country’s wine regions, the reason why customers choose us is that they recognize our professionalism. We are currently the agent of eight boutique wineries in four wine regions, including Rheingau and Moselle, of which five are members of the VDP. We are well versed in different wine regions, different vineyards, and the historical heritage of the wineries. All of our employees must obtain the WSET Level 2 Certification. I myself have been certified by GWA (Intermediate Level) of the German Wine Institute and the VDP. 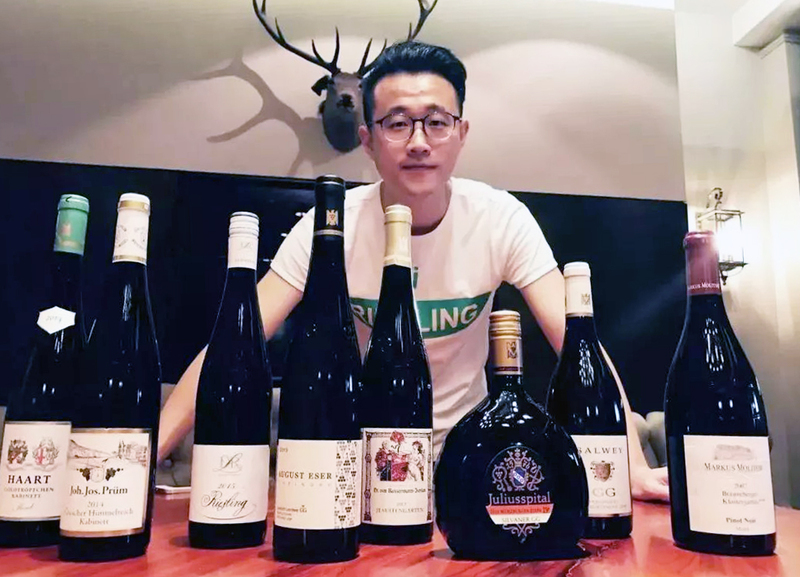 At present, I am trying to become the most professional German wine importer in China. Founded in 2011, Pran Wines is also an importer focused on a single country (Australia). Currently, the company employs more than 30 people in offices in Melbourne, Shanghai and Guangzhou. In 2017, Australian wines showed impressive performance. In October, the country’s wine imports surpassed France. He said: This is a seemingly mission impossible. However in October 2017, it became a reality. I am convinced that there will be more room for development in the future. 1. The middle class is constantly expanding and the consumption of the wine market is upgraded. The advantage of the Australian wine market is not entry-level low-end products and the world’s top wineries, but in many flourishing small boutique wineries. Across all major regions in the country, their wines are affordable and unique, making them ideal for the diverse needs of the middle class. The Chinese wine market has just escalated to the most competitive area for Australian wines. The continuous deepening exchanges between the two countries, the continuous development of tourism and business contacts, and the growing immigrant population will further push Australian wines to seize a larger market share. 2. The tariff reduction brought by the FTA further enhances the price competitiveness of Australian wines in the same quality range. In terms of the effect of the FTAs with Chile and Georgia, the contribution of zero tariffs to the wine trade is even greater than we have imagined (the gradual lowering of tariffs in Australia has also had a very significant effect). Tariffs will be further reduced in 2018 and zero tariffs will be implemented as of January 1, 2019. It is another accelerator to improve the performance of Australian wines in the Chinese market. On the challenge side, he said the first underlying challenge was that the recent incidents showed that there are still instabilities in the relations between China and Australia, which will have an adverse impact on imports from Australia. The case of South Korea is a lesson. Except that, there is no big deal! The above is the first part of the interview series. In the next part, we will invite the two wineries again to talk about the new opportunities and new challenges in 2017. Founder of Fermentation, Wine Educator of Grapea Wine and Spirits Education Institution.